In Control System Toolbox™, PID Tuner lets you perform automatic, interactive tuning of PID controllers for plants represented by LTI models. 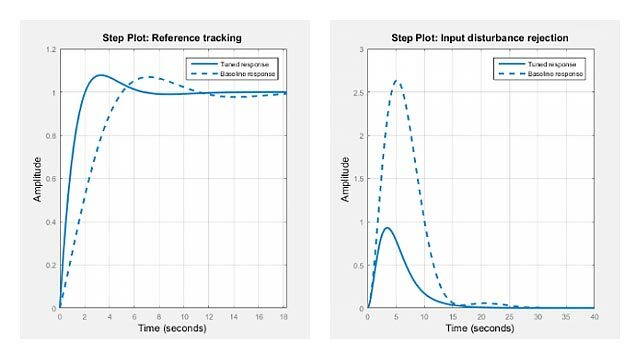 For information about using PID Tuner to tune a PID Controller block in a Simulink® model, see Introduction to Model-Based PID Tuning in Simulink (Simulink Control Design). Use PID Tuner to interactively design a SISO PID controller in the feed-forward path of single-loop, unity-feedback control configuration. PID Tuner automatically designs a controller for your plant. You specify the controller type (P, I, PI, PD, PDF, PID, PIDF) and form (parallel or standard). PID Tuner can design 2-DOF PID controllers in which the setpoint weights can be free and tunable parameters. PID Tuner can also design controllers in which the setpoint weights are fixed in common control configurations, such as I-PD and PI-D.
You can analyze the design using a variety of response plots, and interactively adjust the design to meet your performance requirements. where sys is a linear model of the plant you want to control, and type is indicates the controller type to design. where Cbase is a baseline controller, allowing you to compare the performance of the designed controller to the performance of Cbase. For more information about sys and Cbase, see the pidTuner reference page. You can also open PID Tuner from the MATLAB® desktop, in the Apps tab. When you do so, use the Plant menu in PID Tuner to specify your plant model. Provide the type argument to the pidTuner command when you open PID Tuner. For example, pidTuner(G,'PIDF2') opens PID Tuner with an initial design that is a 2-DOF PID controller with a filter on the derivative term. Provide the baseline-controller Cbase argument to the pidTuner command when you open PID Tuner. PID Tuner designs a controller of the same type as Cbase. For example, suppose C0 is a pid controller object that has proportional and derivative action only (PD controller). Then, pidTuner(G,C0) opens PID Tuner with an initial design that is a PD controller. In PID Tuner, use the Type menu to change controller types. The following tables summarize the available PID controller types. For more information about these controller types, see PID Controller Types for Tuning. PID Tuner can automatically design 2-DOF PID controller types with free setpoint weights. The following table summarizes the 2-DOF controller types in PID Tuner. For more information about 2-DOF PID controllers generally, see Two-Degree-of-Freedom PID Controllers. Use PID Tuner to design the fixed-setpoint-weight controller types summarized in the following table. For more information about these controller types, see PID Controller Types for Tuning. Provide a discrete-time baseline controller Cbase to the launch command pidTuner. PID Tuner designs a controller that has the same discrete integrator formulas as Cbase. After launching PID Tuner, click Options to open the Controller Options dialog box. Select discrete integrator formulas from the Integral Formula and Derivative Formula menus. For more information about discrete integrator formulas, see the pid, pid2, pidstd, and pidstd2 reference pages. Provide a standard-form baseline controller Cbase to the launch command pidTuner. PID Tuner designs a controller of the same form as Cbase. Use the Form menu to change controller form after launching PID Tuner. For more information about parallel and standard controller forms, see the pid, pid2, pidstd, and pidstd2 reference pages.